THE HAT SQUAD: REMEMBERING ROBIN WILLIAMS ON "SESAME STREET"
Last month, one of the comedy legends passed away - Robin Williams. Most of us never saw the dark places in which he was trapped and he made sure the public never saw that deeply into his tortured soul. He was the embodiment of that "Tears Of A Clown" archetype. 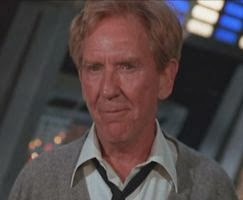 But while he was on this Earth, he made great contributions to Earth Prime-Time. Of course, it was Mork from Ork who first put him on the Toobworld map and there will be more in celebration of alien man-child at some point here at Toobworld Central. There was his guest appearance on an early episode of 'Homicide: Life On The Street' that gave that struggling young gem of a series the boost it needed to stay alive in the ratings. His HBO special taping him "Live At The Met" remains a pinnacle in televised comedy acts while his appearances on plenty of talk shows always promised a manic explosion of his unbridled genius. And for the younger set of viewers here in the Trueniverse, Robin Williams made sure that despite whatever torment he may have been suffering, he put on that brave front and helped those children through the visits he made to 'Sesame Street'. We've already offered a Toobworld splainin for all of the characters in the Nottingham area who looked like the outlaw Cedric Derwent, but I'd like to suggest a pozz'ble, just pozz'ble theory of relateeveety that continued on from Cedric. The theory was inspired by this screen capture of Victor Woolf as Cedric/Derwent. 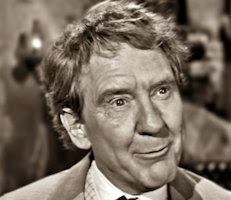 There's just something in his facial features which suggests to me that he could be the roots to a family tree that contained all of the TV characters played by Burgess Meredith. So many centuries had passed that all of these genetic look-alikes would find their relation to each other tenuous at best. But there would be no denying that they resembled each other. That's because at some point in their family's common timeline the right combination of the DNA sequence was created and took hold before the off-shoots of the family tree went their separate ways. 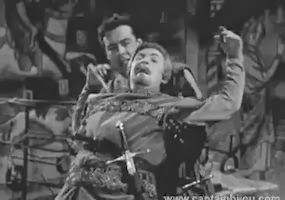 "THE COMING OF ROBIN HOOD"
The three Rumpole siblings - Horace (who was a fixture at the Old Bailey) and his twin brother (who would one day be known as "Number Two") and their younger sister (whose married name was Mrs. Warbus) - were descended from a Norman nobleman named Sir Roger deLisle and Lady deLisle. Sir Roger had taken ownership of the Locksley estates by command of Prince John when rumor had returned to England that Robin Locksley perished in the Crusades. 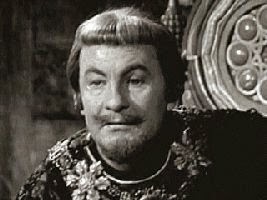 But when Locksley returned very much alive,his identity was denied by the Sheriff of Nottingham and Sir Roger's claim was upheld. In order to ensure the claim would stand fast, Sir Roger laid a trap for Robin Locksley, but instead he fell victim to it. Blamed for the nobleman's death, Robin sought refuge in Sherwood Forest where he fell in with the gang of Will Scatlock's outlaws who called him Robin of the Hood. Eventually Robin the Hooded Man assumed leadership of these "Merry Men" and so began the legend of Robin Hood. If Sir Roger and Lady deLisle had any children, they were not seen during the episode. But that doesn't mean they didn't exist. As the deLisles were middle-aged, their children would have been adults and away from the castle attending to their own affairs. One of their sons may even have joined King Richard on the Crusade. But most of the children would have returned for their father's funeral and to continue holding the castle against Robin Locksley's claims - at least until King Richard could return and set things a-right. Then a knight being an actor." In this episode, three knights decide to spend their tournament downtime as bounty hunters - hoping to kidnap Robin Hood and bring him back to the Sheriff of Nottingham for a reward of 750 crowns. 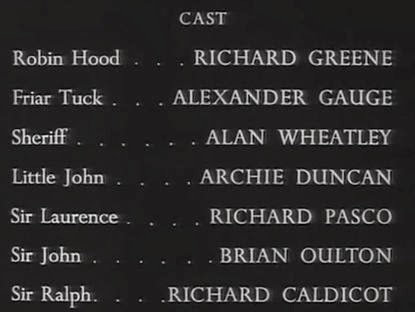 Those three knights were Sir John, Sir Ralph, and Sir Laurence (played respectively by Brian Oulton, Richard Caldicott, and Richard Pascoe. Their plan was to pass themselves off as "strolling players" and to use a magic trick to spirit Robin away. And they almost got away with it! we all come back sooner or later. is more fiction than it's fact. 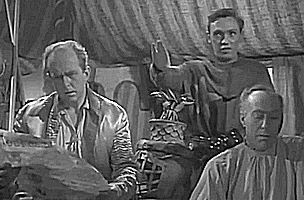 For Toobworld, one of the more notable examples of reincarnation was Roman Emperor Claudius as Chicago psychologist Dr. Bob Hartley. Most talking dogs in Toobworld had been humans in their past lives. Sometimes two souls are so closely bonded that the Universe will do anything to bring them back together in new bodies with new lives, destined to be rejoined. This is what happened with Cornish landowner Ross Poldark and his gypsy wife Demelza from the late 1700s. Eventually they were reunited in San Francisco in the late 1990s as upper class lawyer Greg Montgomery and hippie chick Dharma Liberty Finkelstein who met and impulsively got married. 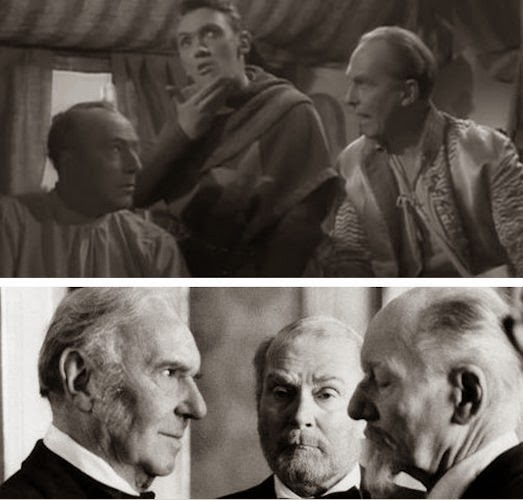 It will be the contention of Toobworld Central that Sir Ralph was reborn as Sir Ralph Richardson; Sir John would one day be Sir John Gielgud; and as for Sir Laurence, he would come back to Earth Prime-Time as Lord Laurence Olivier. Both of them even spelled "Laurence" the same! Outside the Box, I have this feeling that R.W. Bogany deliberately gave those three knights those particular names, as sort of an in-joke reference to those acting titans. One would think both those shows would be relegated to Skitlandia, but the framing devices for such variety programs are always rooted in Earth Prime-Time. This is verified by the mentions of the shows in other TV shows. For Eric and Ernie, it's 'Life On Mars' and 'Ashes To Ashes'. Their actual location doesn't alter the fact that the characters know who Morecambe and Wise were. As for 'SCTV', mostly it's due to 'Mystery Science Theater 3000'. But then, I see 'SCTV' more as a sitcom set in Mellonville, Ohio, with their Skitlandian touches showing up in what they broadcast. But getting back to the basic assertion: Sir Ralph, Sir John, and Sir Laurence were all reincarnated as Sir Ralph, Sir John, and Lord Laurence. Not that I put much stock into end title credits, but both Larrys spell it "Laurence". There has to be almost twenty versions of the story about a homely woman with an inner beauty all over the globe. And they can all exist in the main Toobworld, even if many of them feature the woman as being "Betty". The last names usually change, the names of the other characters are different. Her location and the type of work environment she's in are altered as well. 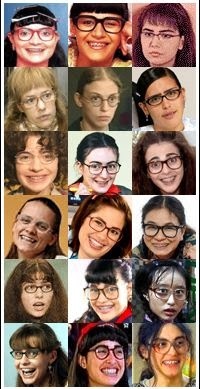 Most remakes of 'Yo Soy Betty La Fea' (the original series from Colombia) can be found throughout Latin America. But it can also be found in countries like India, Russia, Israel, Greece, Croatia, The Phillipines, and the Czech Republic. Even after seeing most of the credits listed below and all of the episodes of 'Endeavour' so far, I never knew who Russell Lewis was. His name didn't jump out at me from the credits and nothing remarkable in his scripts made me take another look at who was the writer. That is, not until the script for the episode "Rocket". In that, every member of the family was based on someone from the family of Henry II, with their names being the chief clue as to who they were based on. When the series returned, I started noticing other in-jokes, many of them literary in nature. This only made sense as 'Endeavour' is a prequel to the 'Inspector Morse' series and that began life over in BookWorld thanks to Colin Dexter. 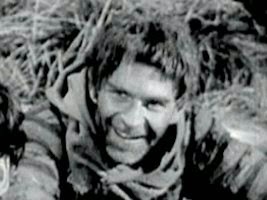 Russell Lewis began his career as a child actor, first appearing in the 1969 film adaptation of "The Looking Glass War". In 1972 Russell played Winston Churchill, age 7, in the movie "Young Winston". He also starred as George Gathercole in "The Kids from 47A". He appeared in an episode of 'London's Burning' in 1989. By the mid-1980s, Lewis had begun to write for television series; some of his episodic writing credits include shows for 'Kavanagh QC' and 'The Bill'. Lewis has co-written three of the Sharpe films, "Sharpe's Battle", "Sharpe's Challenge" and 2008's "Sharpe's Peril". He also penned several episodes of 'Cadfael' and an episode of 'Hornblower'. In 2009, Russell adapted Agatha Christie's novel "The Pale Horse" for the fifth series of ITV's 'Agatha Christie's Marple' starring Julia McKenzie, which first aired in 2010. He devised and wrote the 'Inspector Morse' prequel 'Endeavour' which was first broadcast on 2 January 2012. He wrote the pilot film and all 8 of the subsequent two-hour installments so far. In "Home", a London Gangster transplanted in Oxford fears his higher ups, who are identified as the "Fletcher Brothers", which is the name given to the London Gangster employers of Get Carter's Villain Protagonist. "Get Carter" is a novel by Ted Lewis. There have been two movie versions, but as for Toobworld, it is recognized as a movie ('The Thick Of It'). So it could be suggested that the original novel was based on true events. In "Trove", talent agent Val Todd has a phone call from Mr. White from Play-Tone and another from "Lane from SCDP." Mr. White was from the movie "That Thing You Do!" so this would suggest that this Cineverse character and company have counterparts in Toobworld. But Lane is pure Earth Prime-Time. He's Lane Price who was working for a New York ad agency in 'Mad Men'. In "Nocturne", part of the investigation involves an unsolved murder in 1866. One of the police at that time was Detective Constable Cuff. His superior officer, Sgt. Langley, was a real-world figure who solved the Bermondsey Horror. One of the first cases investigated by the newly formed Detective Branch was The Bermondsey Horror of 1849, in which a married couple, Frederick and Marie Manning, murdered Patrick O'Connor and buried his body under the kitchen floor. After going on the run they were tracked down by Detective Sergeants Thornton and Langley and publicly hanged outside Horsemonger Gaol in Southwark. In the same episode, the head of the College of Arms is mentioned as being "Sir Hilary." Sir Hilary is said to be on holiday. This is Sir Hilary Bray who was abroad visiting Ernst Stavro Blofeld as told in Ian Fleming's "On Her Majesty's Secret Service". James Bond is a TV character thanks to the 'Climax!' episode "Casino Royale". (Only he was markedly different from his BookWorld counterpart.) Therefore, by association, Sir Hilary does exist in Toobworld and this reference confirms that. In "Neverland", the law firm Morse visits has a Mr Vholes as one of its partners. Mr. Vholes maintained the family tradition of entering Law. One of his ancestors worked as a lawyer in Dickens' "Bleak House" which also had several TV adaptations. In Nocturne, the signpost to Slepe also pointed the way to Midwich and to Crampton Hodnet. "Crampton Hodnet" is a comic novel by Barbara Pym, published posthumously in 1985. It was originally written around 1940. As far as I know, it has no TV counterpart, but I thought I'd include it. As with Mr. White of Play-Tone, it is implied that Crampton Hodnet must exist in Earth Prime-Time. As for Midwich, it is the village in "The Midwich Cuckoos" by John Wyndham. This was adapted into a movie back in the 1960s and then as a TV movie in the 1990s with Christopher Reeve and Mark Hamill. Lewis has a lot of fun with the names of characters in these stories. In "Nocturne" also, one of the girls was named Bunty Glossop. This would mean that she could be related to the Glossop family members who were in Bertie Wooster's circle of friends in the stories by P.G. Wodehouse. There have been two TV adaptations of those "Jeeves & Wooster" stories. Another character had the strange name of Nahum Gardiner - the same name as a character in an H.P. Lovecraft story "The Colour Out Of Space". In "Nocturne", Gardiner and his wife are from Kingsport, Massachusetts, which is yet another Lovecraft connection. Based on all of that (and probably plenty more that I missed - still not sure if the surname Ashenden should be a reference), Russell Lewis has given quite a few viable links to other sources not only in TV but in the Cineverse and BookWorld as well. I would even suggest some of my associates engaged in the Wold Newton Universe studies might consider adding in Endeavour Morse to the greater WNU Family because of some of these connections. 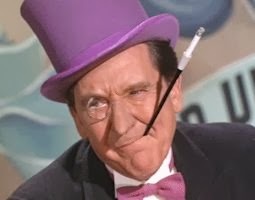 And that's why Russell Lewis is the September inductee into the TV Crossover Hall Of Fame, the month in which we usually select somebody from behind the scenes who has made a significant contribution to the expansion of the Toobworld Dynamic. There's one last bit o' business we have to take care of before we finish off our annual salute to the TV Western - a final tip o' the Stetson to the late James Garner. Without him making Bret Maverick such a fantastic member of Toobworld's wild, wild West, just about all of the blog posts this month would never have been published. So blame him, not me. 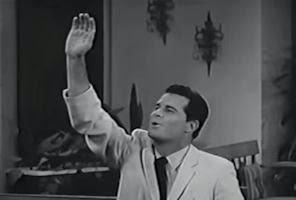 But today, in memory of the man who gave us those two giants among TV characters, Toobworld Central is welcoming James Garner himself into the TV Crossover Hall Of Fame and its "League Of Themselves" wing. And thematically, it can all be traced back to his embodiment of Bret Maverick on the TV screen. 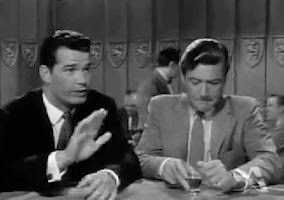 First up: the "Downbeat" episode of '77 Sunset Strip' in which Garner tried to give some friendly advice to his old pal, private eye Stu Bailey. Bailey (TVXOHOF member since January, 2013) and Garner had been old friends "since the Flood". 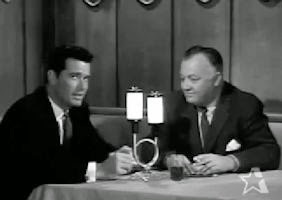 Garner had been at Dino's Lodge being interviewed by future Hall of Famer James Bacon, the Hollywood columnist. Stu Bailey, though acquitted of the crime of sedition for lack of evidence, has his private investigator's license revoked and goes on a drinking spree. He is then recruited by a former friend to conduct business with Communists. 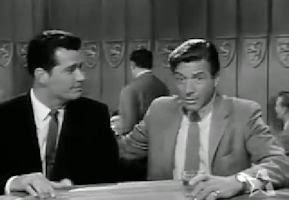 Although he is acquitted for lack of evidence of the crime of sedition, Bailey's private investigator's license is revoked and he goes on a drinking spree. He is then recruited by a former friend to conduct business with Communists. If you'd like to see that episode, click here. The interesting thing about this encounter is that Garner greets Bailey with "Hello, Sherlock", while Bailey responds with "Hello, Maverick. Are you looking for cattle rustlers? Or a card game?" So on Earth Prime-Time, James Garner also starred in a TV show called 'Maverick', but this is NOT a Zonk. Bret Maverick was an historical figure from the Old West and so why shouldn't he have a TV show made about his life? Just like other historical Westerners such as Bat Masterson, Wyatt Earp, Judge Roy Bean, and Annie Oakley? Annie Fargé portrayed Angelique "Angel" Smith, a pretty, young scatterbrained Frenchwoman who comes to the United States and marries a young architect, John Smith, played by Marshall Thompson. With her distinct French accent, Angel gets into various problems with the culture, language, and procedures in her new country. 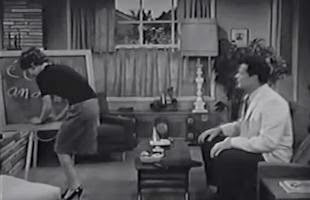 In the episode "The Dentist", for instance, she learns she must pay when late for her appointment with the dentist (played by Parley Baer in this episode). Now, to be eligible for membership into the TV Crossover Hall Of Fame, one must have three credits from three different sources. But the rules are flexible enough to allow for one of those credits to be just an acknowledgement that the candidate exists in Toobworld. And that's the case with James Garner's third qualification. 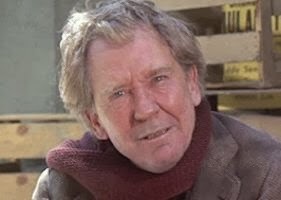 Back in the 1980s, a couple of old stars of TV Westerns were reunited for a Roy Rogers TV special which saluted the Hollywood stuntman - James Drury and Doug McClure from 'The Virginian', Pat Buttram (Gene Autry's sidekick), and Jack Kelly from 'Maverick'. "Oh, if Jim Garner could only see me now!" 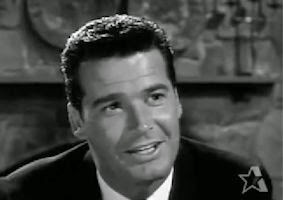 So it's further affirmation that James Garner has a televersion (if we didn't already have more solid proof by his earlier two appearances as himself), and it's implied that he was also part of 'Maverick' like Kelly was. And if you want to see THAT episode, click here! It might not seem like enough to get James Garner inducted into the Hall, but remember - this is the fifteenth anniversary of the TVXOHOF's existence and for this year-long special occasion we follow the mantra "What I say, goes!" As we conclude our month-long salute to James Garner, Bret Maverick, 'Maverick' the TV show, and especially "Maverick" the movie, we have one last gambler to look at from that marathon poker competition. 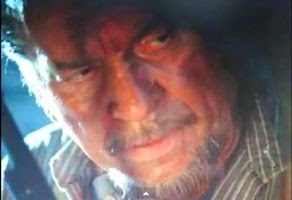 Played by Waylon Jennings, he never even got the chance to play because Bret Maverick Senior caught him and his lady friend (played by Kathy Mattea) sneaking concealed guns on board the riverboat. So who was that tall dark stranger there? 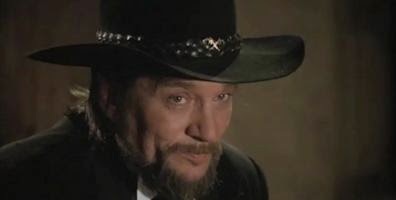 Waylon Jennings was better known as a singer and his best Toobworld presence was a combination of acting and singing - as "The Balladeer", that ghost-like, unseen narrator of each episode of 'The Dukes Of Hazzard'. It's "Slim Pickins" for options as to who Waylon's gun-toting gambler was. One pozz'bility could have been Tobey Naylor in "The Long Kill" - if it weren't for the fact that his murder near the beginning of the TV movie is the catalyst for the rest of the movie. I haven't seen this TV movie, so I don't know if it holds true to the original story. 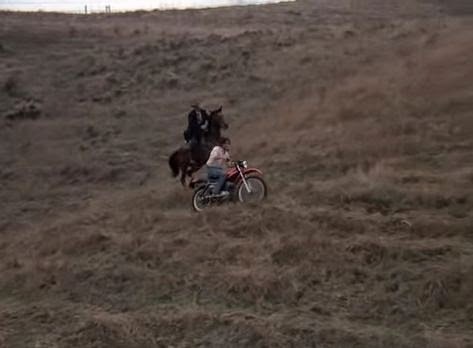 If I remember that correctly, the gambler (played by John Carradine) died during the journey. The same may have been the fate for Jennings' Hatfield. In the end, it doesn't matter. The only thing that mattered was that I gave Waylon Jennings' "Maverick" cameo a showcase on this specific day. Because today is the birthday for my cousin Coco Manson, and Coco is a big fan of Waylon Jennings. How could I not take this opportunity to acknowledge that and wish her all the best for the next trip around the Sun?